In The Film Industry, An “Apple Box” Is Used To? A Big Chunk Of Which Video Game's Advertising Budget Was Spent On Educational Videos? In real life, it hardly matters what height we are when it comes to chatting with a colleague. We don’t mind looking up, looking down, or even taking a seat at a table so that our height differences aren’t such an issue. When it comes to movie magic, however, the framing of shots demands that actors be placed in closer proximity to each other and height differences are exaggerated within the tight framing of a movie camera. Enter the humble “apple box”. Whenever there is a significant height discrepancy between actors, an apple box is employed to help smooth out the variation. Apple boxes are sturdily constructed specialty boxes that come in a wide variety of sizes including the general apple box, or “full apple”, that measures 20″x12″x8″ all the way down to a “pancake”, which has the same footprint, but is only 1″ thick. On rare occasions, a box design gets used so frequently that it even gets nicknamed after the actor who uses it. 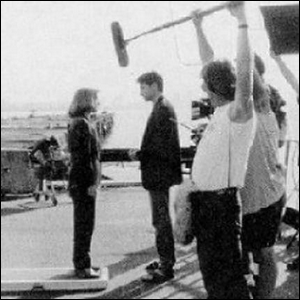 One particularly notable example of this is the “Scully Box”, seen here, a very wide platform style box that was created to help reduce the height difference between actress Gillian Anderson who plays Agent Dana Scully on The X-Files and her partner Agent Fox Mulder, played by David Duchovny. Anderson is only 5’2″ tall and Duchovny is 6’0″ tall. Because nearly every scene called for an apple box of some sort, various wide-body boxes were constructed to allow Anderson to move around more easily without falling off. Image courtesy of 20th Century Fox.